November 1st. Busy day. We start off Episode 040 with Jack working on Boone, including the always pleasant "jam a sharp metal object into someone's chest to help them breathe because they have a collapsed lung". And then we follow that up with the even more pleasant "here's a stick to bite on while I set your broken leg and you cry out in excruciating pain". Lots of cringeworthy moments in this episode. Then, because we don't have enough things going on, Claire goes into labor in the middle of the jungle. All the while Sayid takes Shannon off on a romantic getaway. But, as Jack preps to give Boone a blood transfusion, we throw another wrench into things with a time flash. Juliet, Sawyer and everyone have arrived from 1954, and Charlotte's not doing so hot, as her nose starts bleeding and she collapses. They all head to the Orchid to try and see what they can do about the time flashes, since they started right after Ben turned the wheel down there. Meanwhile Jack's giving blood, and Charlie's off with Jin to go help Kate deliver Claire's baby. Jack discovers that Boone didn't fall off a cliff, and that his leg had been crushed by something, and realizes he needs to amputate Boone's leg. Down in the hatch, Desmond is having some emotional problems after spending a month by himself without Inman, and decides to kill himself. But as he goes to read the last book he'll ever read, he reads Penny's note to him, and decides he can't go through with it. After trashing the hatch, he hears a thumping noise, which is coming from an equally desperate man, John Locke, who is pounding on the hatch door from above. Desmond turns on the light, and smiles, because he thinks his replacement has arrived, while Locke stares at the light in bewilderment. We cut to time flash Sawyer and Locke, marching through the jungle on their way to the Orchid, when they see the beam of light from the hatch in the distance. Locke knows what it is, and decides to stay away from it. Jack gets ready to amputate Boone's leg, but right before he does, Boone stops him because he knows he's going to die regardless. Claire starts to give birth, and the time flash group hears her screams from a distance. Sawyer goes on ahead to investigate, and witnesses Kate deliver Claire's baby. Right after it happens, another time flash occurs and they disappear. Jin and Charlie celebrate the birth of Aaron, as Boone dies in front of Jack. The next morning Claire and Kate bring Aaron to the beach for everyone to see, and Sayid and Shannon return from their night together, and Jack delivers the sad news of Boone's passing. 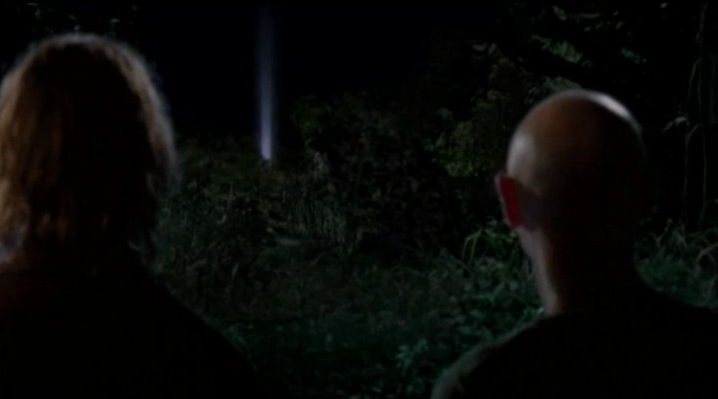 We end the episode with Shannon grieving over Boone, and Jack heading off to find John Locke. The episode runs 43:23 and is 350MB to download. You can stream below (via Facebook), or go here to use torrents (better quality, recommended) to download the episodes to your computer. ooooh i've been looking forward to all this action! keep up the great work! I'm on episode 4 and I think you're doing an awesome job, just wondering if you ever end up switching the aspect ratio so that the black bars are gone and it's actually in widescreen? If you don't, you don't, but that is my one complaint, otherwise your work is frequently seamless and I love that you're putting in all this work. It's unfortunately a limitation of converting the files to the .flv format, which I did for the ease of uploading. However, I am planning on releasing DVD-quality .mp4 files onto a torrent once I initially get all of these episodes out, and those episodes will be much better quality, and will not have any black bars in them. I think you may have made a mistake here, friend. The time flash, with Locke, Sawyer and co seeing the beam of light in the distance, wouldn't that be from the first episode of season two, when Kate was going down the rope into the hole? The scene with Locke pounding on the door, produced only a small light, rather than the bright beam in 'Man of Science, Man of Faith'. Just an observation. While that's a good point, you forget that the rest of the flash includes Sawyer witnessing Claire giving birth to Aaron, which is what happens at the end of this particular episode. If it was the light from Kate climbing down the hatch, that wouldn't have happened for another couple of days, after Aaron was already born. So it had to be from when Locke was pounding on the hatch door.